Visiting our website, reading about the animals, and regularly checking out our blog are just some of the ways you can help to save wildlife. We spend a lot of time researching the animals and wild places that need protecting. And, we share this information freely so that others can be informed about the status of the many animals on our planet that are either threatened species or are on the verge of becoming threatened species. We often post information that will allow you to take direct action (e.g. by adding your signature to a petition or sending an e-mail to your Senators or Congressmen.) We are passionate about Our Mission and work tirelessly to raise awareness through our sharing of information about the many wild animals whose status is critical, endangered, or threatened and by asking you to tell others. And, of course, you help us directly whenever you purchase and wear one of our Animal Eye Collector Pins, t-shirts, or other items from our online Gift Shop and by telling others about us. We use our website to foster awareness of the plight of many wild animals throughout the world that are in need of protection. We are excited when people reading our blog take action when they feel compelled, as we often are, to speak up and work for positive change in the way our governments and elected officials create the laws that determine how natural resources are utilized or protected. The internet has made the world a smaller place and a world that is connected. 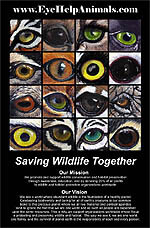 It is so rewarding to think that we can live in the United States of America and work to help save wildlife in Africa! We can help to save the Mountain Gorilla and change its status from Critically Endangered to one that is stable. We recognize that we are one world and that wildlife everywhere belongs to everyone. Anything is possible if you are open and believe in the power of one. The one thing in common that all wildlife conservation and habitat preservation organizations need is money. That is why we are committed to donating 25% of our profits to organizations that are committed to protecting wildlife and in providing and ensuring a safe and as natural an environment as possible for them.